I haven't posted in a long time, but I have actually been building stuff. I promise. 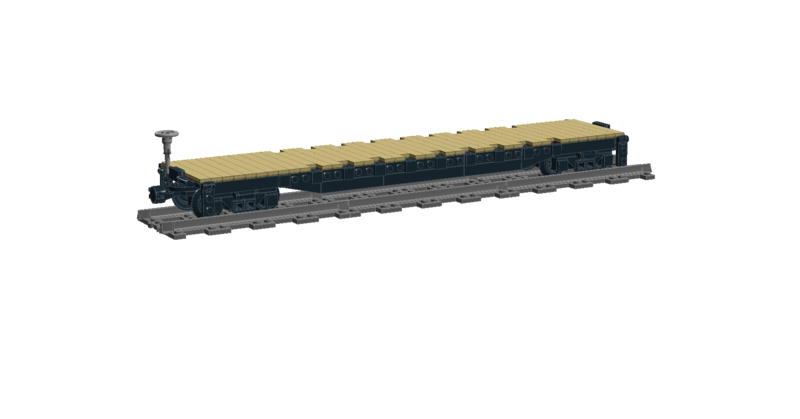 and as such it was time to build some regular freight cars. which are apparently quite rare. circle parts, but I did not want them to make up the load-bearing structure (so you can't pull the car apart). 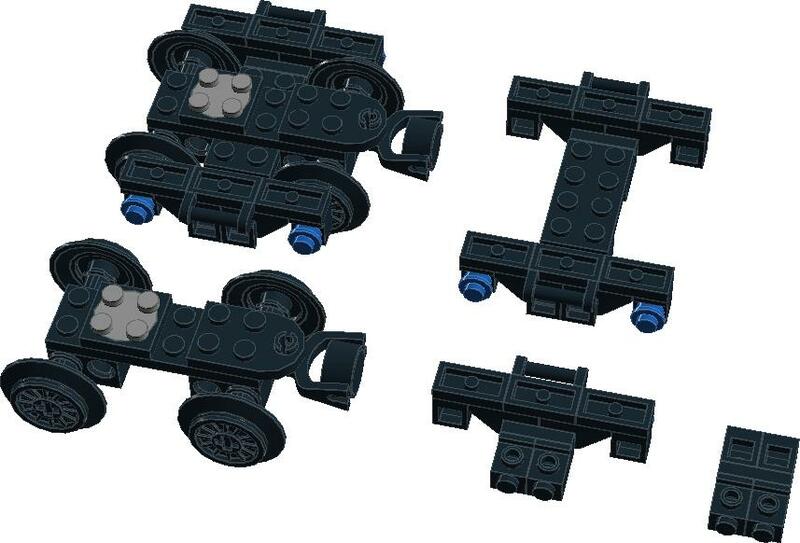 and bottom set of circle parts can connect at alternating bulkheads. and I believe my drawing is for the bottom one, but the car itself really takes more from the top one. you press on the car in a turn there is still a but of scrubbing, but for now I consider that acceptable. needed to go around the ends. It's probably the sturdiest of the three cars, but also the heaviest. 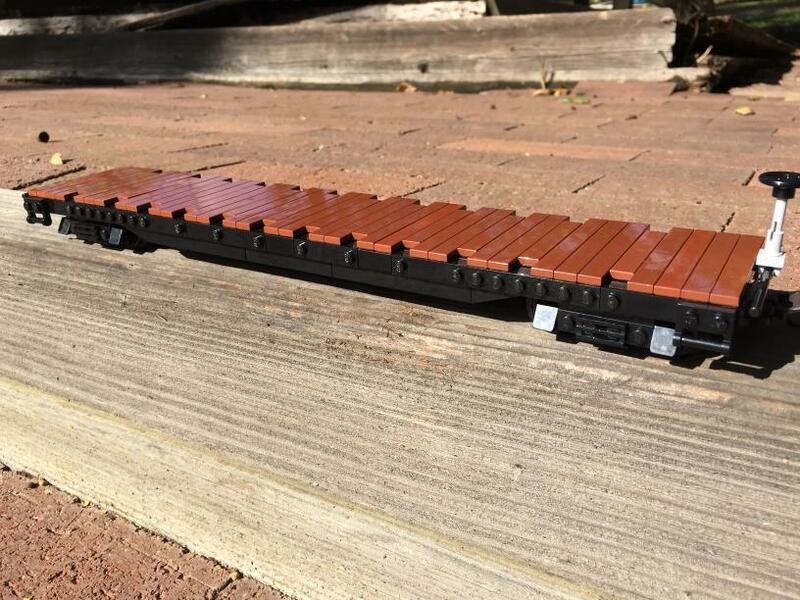 locomotive in the works too, and it will be interesting. These look great! I love that well car! 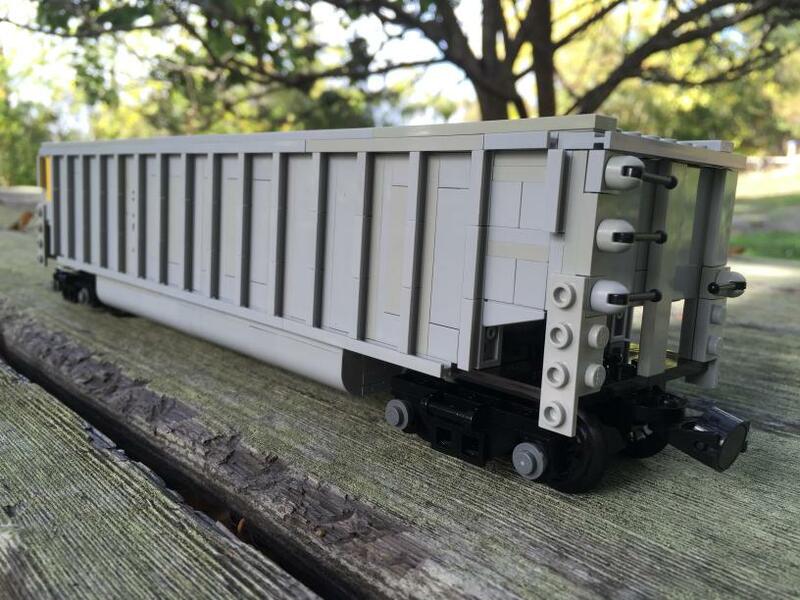 It looks like you are modeling about 1:48 and I really like it! 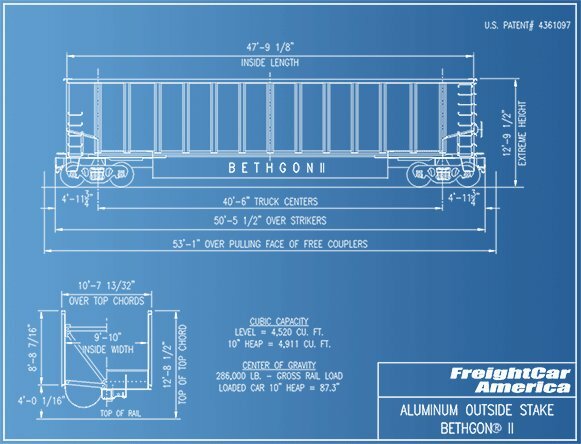 Any chance you could do a breakdown of that great truck design? Love them all. 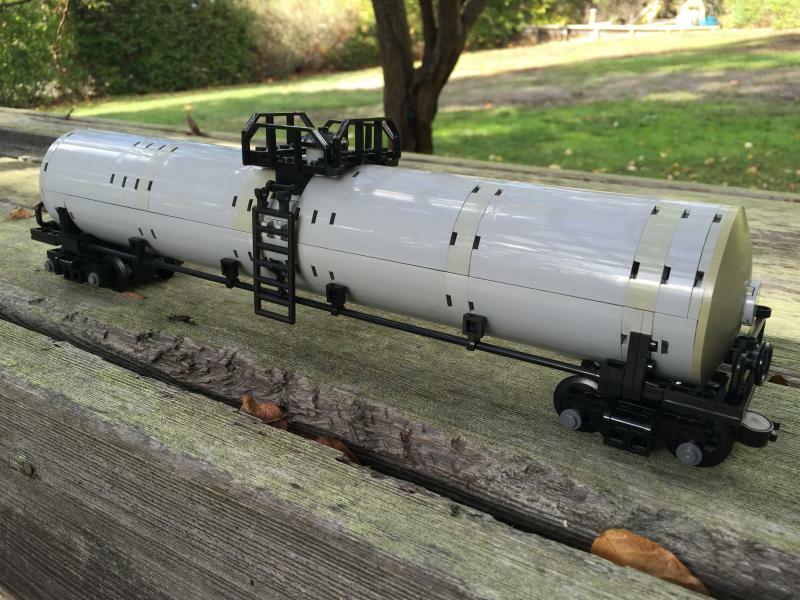 I'm totally going to steal some of the details for my own tankers and gondolas. How many of each did you make? These are indeed 1:48, 15" per stud. 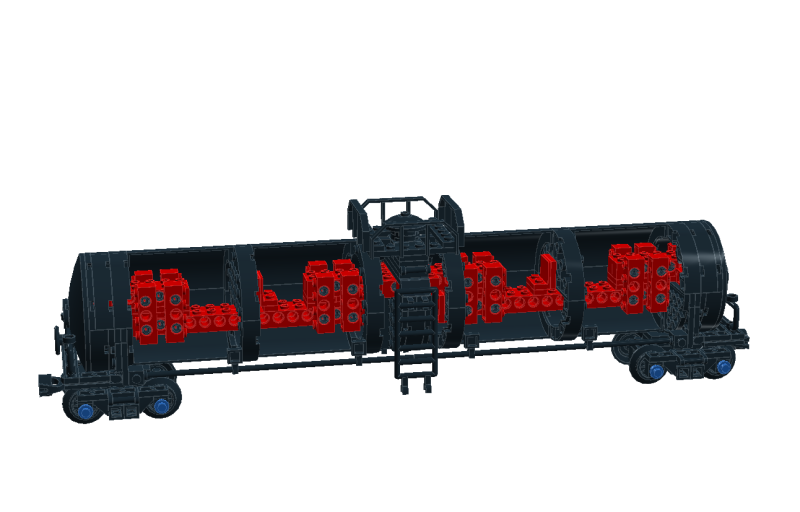 I may someday do a full writeup on the well car if I can make it more usable. 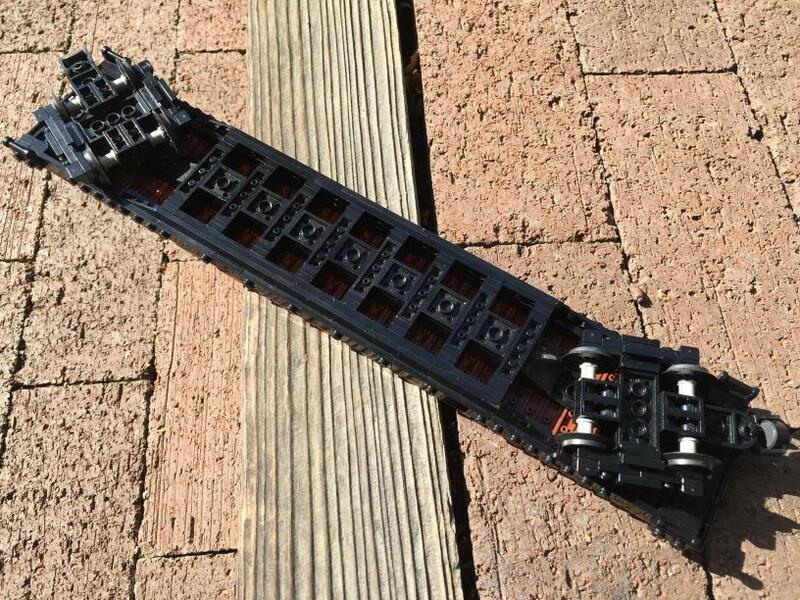 All the wheels are BBB wheels such that the side frames can be as narrow as possible (the net effect is more than just the difference in wheel thickness because you generally have to use 6L axles with official wheels). 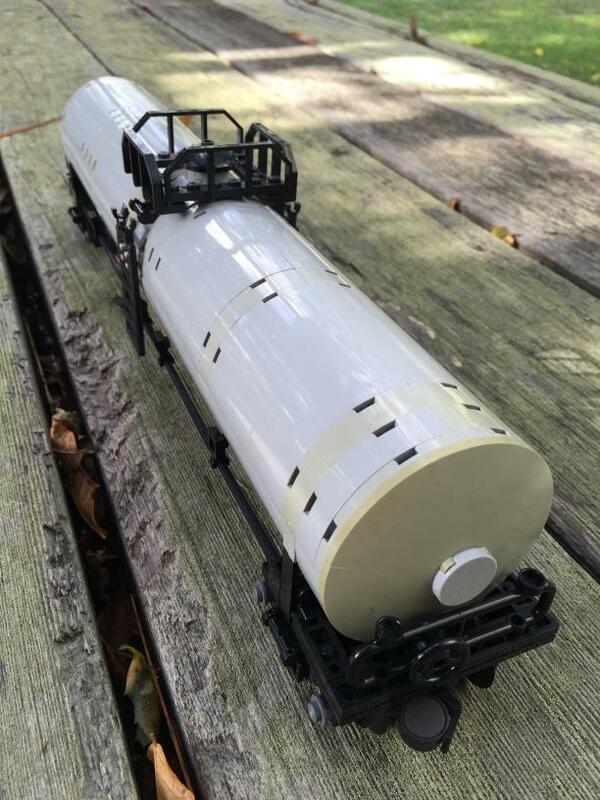 I haven't built multiples of any yet, I started gathering parts for a second tank car, but I want to build a few more unique models, see which ones I like most, and then duplicate those. So more to come soon on that front! 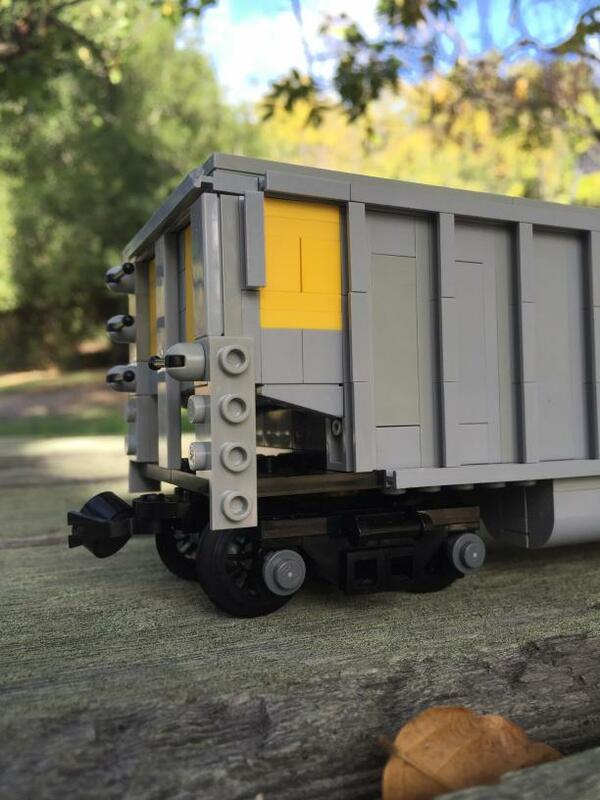 The flat car looks fantastic ...but all of them are gorgeous! They are all really nice, put my efforts to shame. 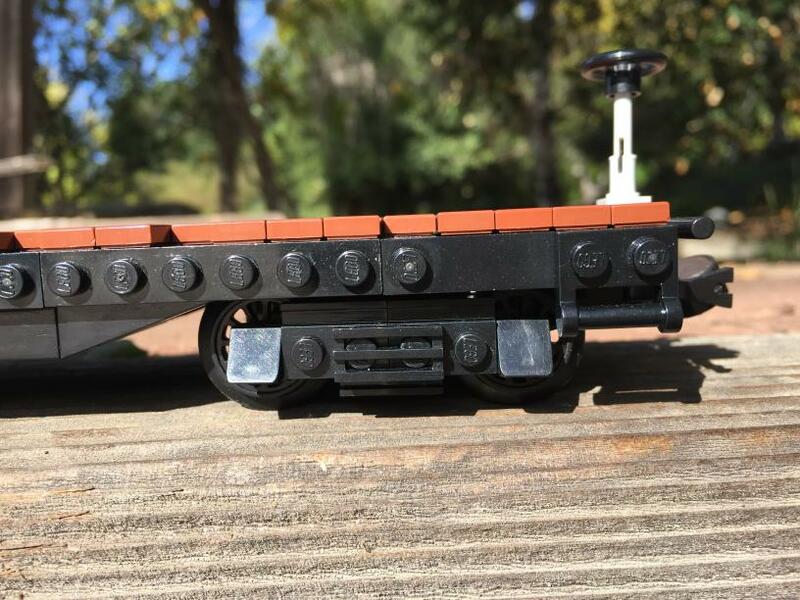 I like how the New Haven car was the inspiration for the flat car - good choice! Technically the hopper is a bathtub gondola - hoppers have doors on the bottom to unload whereas these have to be turned upside down. But that's just semantics, and doesn't change the fact that it's a really good looking car! I like the levers as the grab irons. I see a lot of these at our research site in western Nebraska. 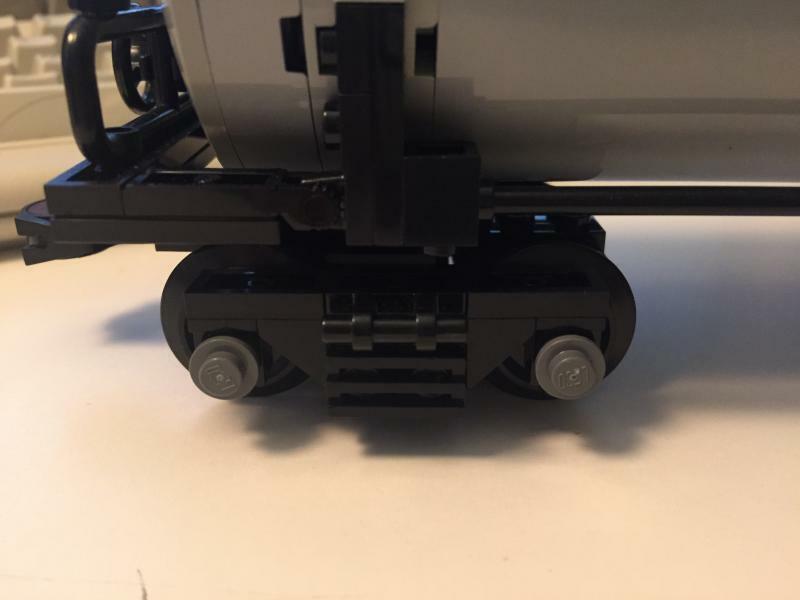 Any particular reason you chose to use Technic axles for the trucks? I know the resistance on those is pretty high. I was going to contest you on that, but I think you are right. Somehow I thought that these had bottom doors, but looking again, that doesn't seem to be the case. Good catch! 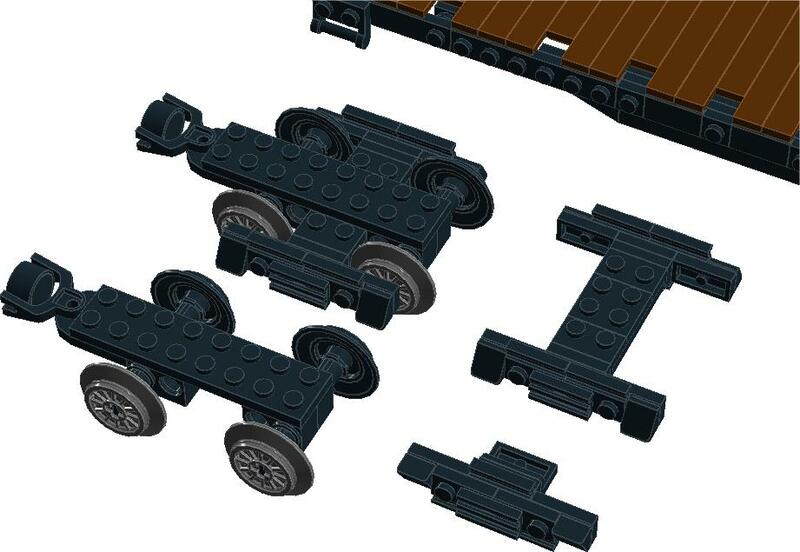 From a functional perspective I would definitely prefer to use the stock wheelsets, but they are so egregiously hard to build around if you want an American truck aesthetic that you basically have to use the Technic stuff. 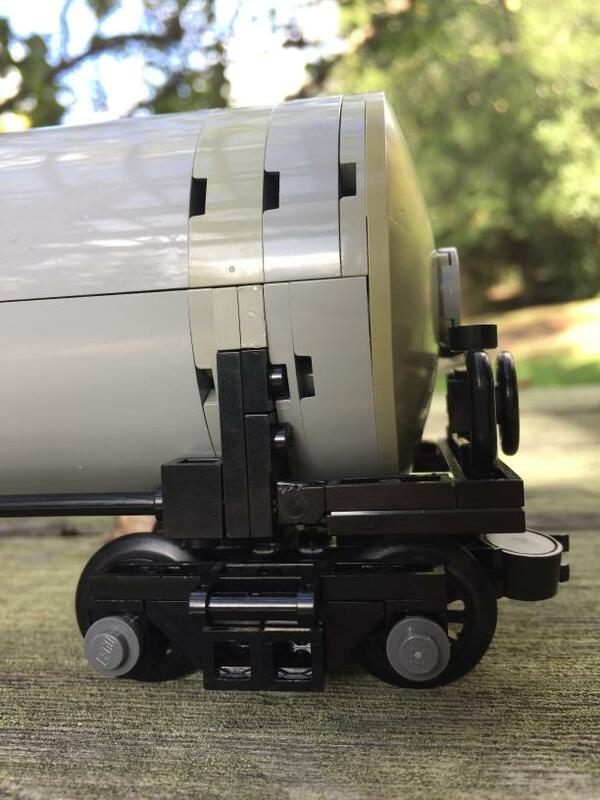 You can mitigate the friction a little with lubrication, but even then you are limited to trains of maybe 4 to 5 cars if you are running on 9v power (which our LUG does). 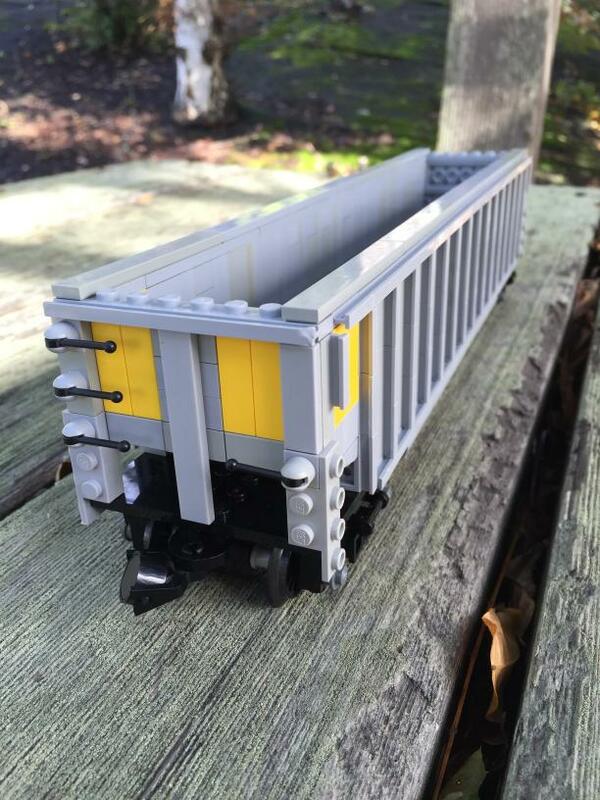 It's on my to do list to see if I can make a reliable truck with popped out wheelsets, but I haven't gotten around to it yet. 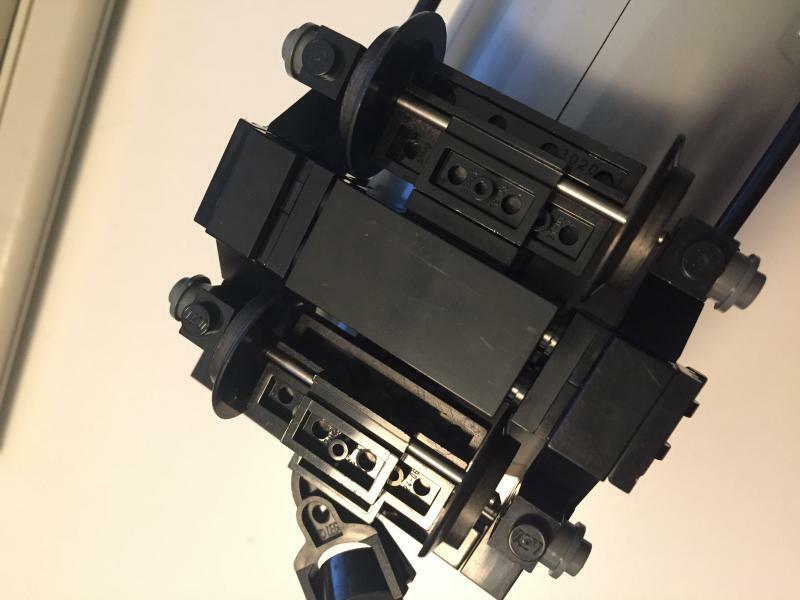 If you are ok with using non lego for a small part of it, some folks here have had great luck using some small ball bearings in technic bricks and lift arms. ... and a bonus video with the freight cars in action testing the layout at our annual Christmas show. Come visit the display if you live in the SF Bay Area! Wow! Super intricate! 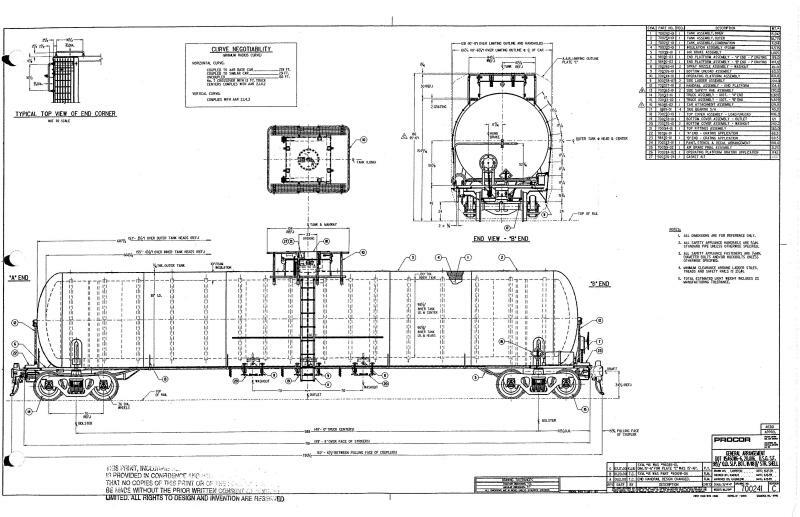 I think the picture that was the coolest was the interior of the tanker cars, I would have never guessed so many pieces fit inside in that configuration to hold it together. And they look very realistic.